After a tightly-fought election, incumbent Prime Minister Benjamin Netanyahu’s Likud party have secured a decisive victory courtesy of a strong showing for the right-wing parties, making him the longest-serving Prime Minister since the creation of the Jewish state. 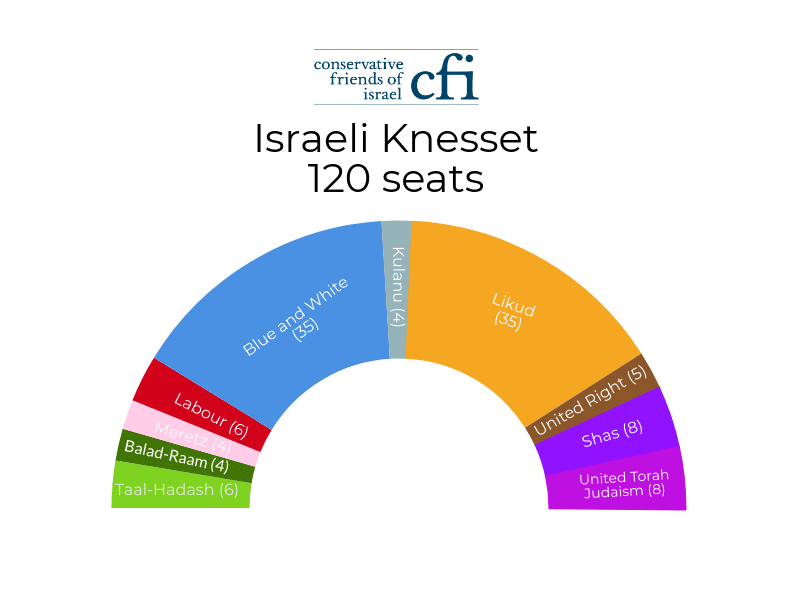 With more than 97% of votes counted, Mr Netanyahu’s Likud party looks well-placed to form a right-wing coalition that will control 65 of the Knesset’s 120 seats. The votes of soldiers, diplomats and prisoners are still yet to be counted and the final vote is expected to be released by early Thursday morning. In an election that had been seen as a referendum on the incumbent Prime Minister, the results show Netanyahu’s Likud party and main challenger Benny Gantz’s Blue and White each claiming 35 seats. It is the first time in several decades that two parties have so dominated an Israeli parliament, and meant that few parties crossed the 3.25% electoral threshold, and fourth in a row. Uncertainty reigned in the immediate aftermath of the exit polls being released at 10pm Israel time. Some of the exit polls projected Likud as having six seats fewer than challenger Blue and White party, cuing wild celebrations at the Blue and White election party and claims of a landmark victory. It was only later in the night that the counting revealed that polls had been wrong and Likud and the right-wing bloc had secured a stronger mandate. The results are seen as a major win for Benjamin Netanyahu, who managed to increase Likud’s share of Knesset seats despite the shadow of corruption charges, and will now overtake founder of Israel David Ben-Gurion to become the Jewish state’s longest serving leader. This will be his fifth term in office. Addressing supporters at a Likud election party in Tel Aviv last night, Mr Netanyahu hailed it as a “magnificent victory”, adding: “It will be a right-wing government, but I will be Prime Minister for all”. It is predicted that the right-wing bloc led by Netanyahu will consist of centre-right Kulanu, who won 4 seats, far-right United Right (5 seats), centre-right Yisrael Beitenu (5 seats), and the ultra-Orthodox Shas and United Torah Judaism (8 seats each). Blue and White took votes from the left, with the Labor party collapsing to just 6 seats. Labour party leader Avi Gabbay called the results “a huge disappointment”. The left-wing Meretz party won 4 seats. Arab-Israeli merger parties Balad-Raam won 4 seats and Taal-Hadash won 6 seats. Netanyahu succeeded in hoovering up votes from the smaller right-wing parties, severely cutting their bargaining power, while simultaneously managing to maintain enough of a majority for the right-wing bloc. In what has come as a surprise to many, former Defence Minister Naftali Bennett and former Justice Minister Ayelet Shaked’s New Right party did not garner enough votes to reach the electoral threshold (3.25%), and neither did the right-wing libertarian Zehut party. This means that Netanyahu has only five parties to manage in a coalition, rather than the predicted seven. Weeks of negotiations to form a coalition will begin next week when the President of Israel Reuven Rivlin will nominate Netanyahu to put together his government. Already, the far-right Right Wing Union has demanded the education and justice ministerial posts, and it is expected that Yisrael Beitenu leader Avigdor Liberman will demand the post of Defence Minister; Kulanu leader Moshe Kahlon is thought to be seeking a return to the Finance Ministry, which he resigned from only a few months ago. Blue and White leader Benny Gantz this evening ceded defeat and vowed to battle Netanyahu from the opposition. After claiming victory earlier on last night, Mr Gantz, accepted that Netanyahu had the advantage: “The skies may look overcast . . . but they cannot conceal the sun of hope that we have brought to the Israeli people and society”. The Blue and White party was only formed in February, after Yair Lapid’s centrist party Yesh Atid merged with Benny Gantz’s new Israel Resilience party. Exit polls had initially not predicted a victory for Likud, but projections began to change in Netanyahu’s favour throughout the night. Israel’s President Reuven Rivlin has confirmed that he will begin consultations with party leaders next week to determine which candidate he will task with forming the next coalition government. The candidate has 42 days to form a coalition. If the candidate fails to win the support of at least 61 MKs in that time, the President can task another candidate with forming a coalition. The second candidate has 28 days to form a coalition, with no possibility of extension. The most likely scenario is that Netanyahu will form a narrow right-wing coalition comprising of Kulanu, United Right, Yisrael Beitenu, Shas and United Torah Judaism.